​In February 2014, I started writing "Their Heart Was in the Highlands". The story of my great-uncle Angus MacIver and his wife Marion nee Graham. In February 2016, I wrote "Lost at Sea," a story about their son Donald Murdo and two other cousins during WWII. It now has become a trilogy, as this story is about their grandson, Donald Angus MacIver. Donald Angus MacIver was named after his uncle Donald Murdo and his middle name Angus, after his grandfather. His parents were Cecil MacIver from the Isle of Lewis and Flora Campbell from South Uist. Donald was born in Glasgow on the 22nd of July 1962. He was older than his three siblings –Alistair, David and Catriona, the last two who are twins. Donald attended St. Paul's Primary School, then went onto St. Thomas Aquilla's Secondary, where he graduated. 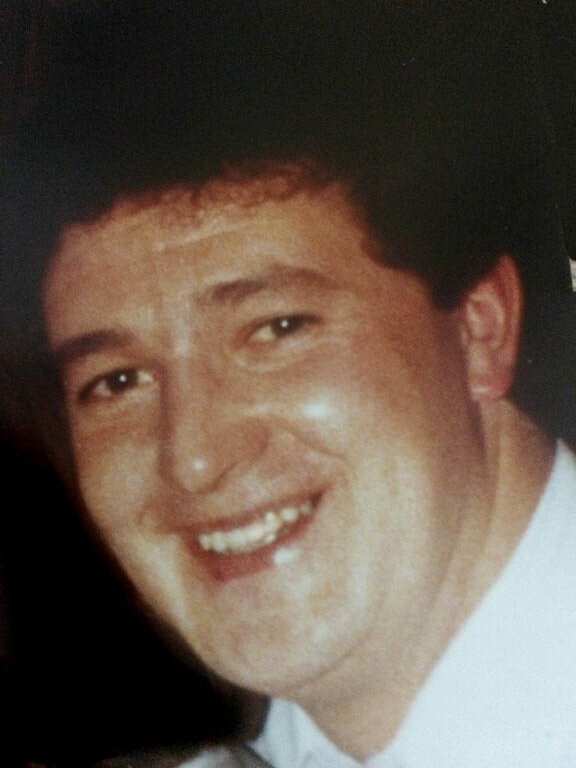 Growing up, he was a fan of the Celtic Football Club, Of course his love of football was why he would play it with the neighbourhood kids in the streets and wherever they could play football. That was what he did a lot as he was crazy over football, like a lot of the young boys were growing up. Many scrapes and cuts and bruises were had from those days. At 16 he decided to leave school and he started an apprenticeship in Yarrow Shipbuilding yard. (This was also the same firm that my dad had an apprenticeship at). He stayed there for two years, then decided that he would like to be a rigger as his dad was working on the oil rigs in the North Sea and the opportunities were plentiful then. It turned out good for them, as Donald was able to start working on the same platform as his dad, which was called the "Brent Charlie". They also had the same shift hours so that meant two weeks on and two weeks off at the same time. This went on for six years and when Donald was on leave he never missed going to see his team play and visiting friends and family. A few of his friends were Rangers supporters, but that did not bother Donald if his team lost it was all in the sportsmanship. In 1985 Donald moved to the nearly "Brent Delta" platform. The oil company had named the Brent platforms after the Brent Geese. All their platforms were named after waterfowl. On his last leave home, his brother David remembers it so well, they had gone to a Celtic football game and afterwards went to their local pub. This was where they always went after the games, either to celebrate or drown their sorrows in the results... to meet up with other mates and have a great conversation, either praising or complaining about what the team did right or what they did wrong. On the day of November 6th, 1986, life changed. A Chinook helicopter which was based at Aberdeen Airport until November 3, 1986, was now based at Sumburgh Airport, Shetland. It was based here as it was used as the shuttle between the Delta platforms for the oil workers. Due to an oil leak that day the Chinook was delayed for taking off. It was scheduled to get the 30 workers that were returning from their leave back to work at the Delta platforms, and the ones that were going "on leave," to pick them up and take them to the Sumburgh Airport for them to get a flight out to their destinations. The problem was rectified and the chopper made its way to the platforms, dropped the passengers off along with mail, picked up 45 passengers from the different platforms along with the mail to be taken to the airport so they could get their flights to go on their two weeks leave. Then the gearbox failure happened, which led to the twin-rotor blade colliding and plunging into the cold North Sea. It was two minutes away from Sumburgh Airport. The ground control never heard anything else from the chopper after giving them the instructions to land on helicopter runway 24. The voice recorder indicated the crew had noticed an increase in noise, followed by a bang. The helicopter hit the sea broke up and sank. Only two survivors were picked up by a passing vessel, one was a crew member and the other was an oil rig worker, who had managed to smash a window to get out of the chopper. A diving support vessel started a search for the sunken wreckage the following morning, sea conditions were rough. The wreckage was located and recovered. All 43 bodies were recovered and returned to the families. For 25 years the families had been asking the oil company to build a memorial – a special place to remember their loved ones. The oil company erected a plaque on the "Brent Delta" platform but the families did not find that to be acceptable as they could not visit the platform. David had said "My brother and the others were hard working men on their way home from work when they were killed. They died together and deserve to be remembered together". ​It was a former coastguard David Ellis who was involved in helping the two survivors to safety that helped organize the memorial. TOP PHOTO: Donald Angus MacIver. BOTTOM PHOTO: The Sumburgh memorial stone. It was the widow of the pilot, Neville Nixon's wife, Pauline Nixon, who raised the idea to Mr Ellis, when she visited Shetland in 2011, to mark the 25th anniversary of the disaster. 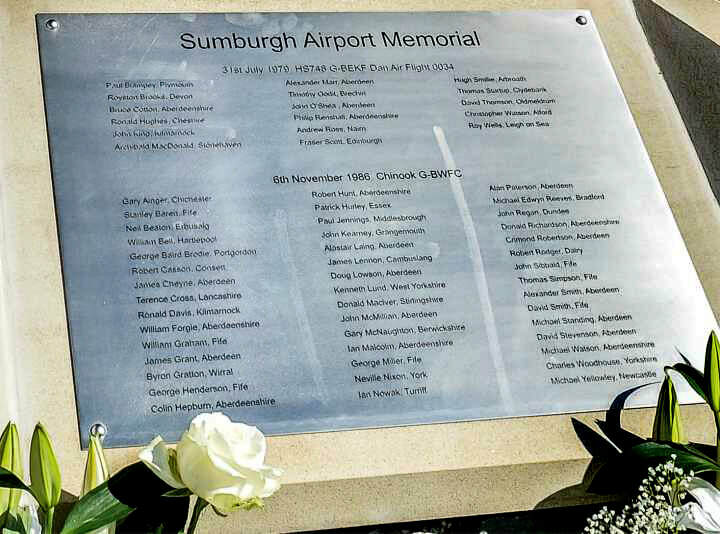 After 30 years, the memorial was finally placed at Sumburgh Airport, Shetland. The memorial is a stone horse-shoe shaped structure with two tea benches. The names of all the accident victims are on it. There is also a tribute to the 34 men in the 1979 Dan Air Tragedy, and 17 men who lost their lives in two North Sea helicopter tragedies – the Brent Spar platform in 1990, and the Commorant Alpha accident in 1992. ​The Air Accident Investigation Board, (AAIB) stated the accident was caused by the failure of a modified ring gear in the forward transmission which allowed the twin-rotors to collide when synchronisation was lost. The underlying causes were the inadequacy of a previously accepted test programme and the failure of a stringed inspection programme. The oil industry decided that the Chinook was too big for the offshore support and the remaining Chinooks were withdrawn and sold. The de-commissioning of the Brent field platforms has started and will be conducted over the 2020's decade. Cecil and Flora had a hard time recovering from this. Cecil never went back to the Oil rigs again. Losing a brother at sea during the war and now losing his son at sea, one cannot imagine the pain and anguish as parents they had to bear, I just know that I cannot put it into words that would express the grief and heartbreaking news. The siblings and all the family members, aunts, uncles, cousins... they all loved Donald and that was what had helped them get through those terrible times. For the Chinook helicopter victims that died on that fateful day, with the memorial now built at Sumburgh Airport, Shetland, the families now have a place to go that helps them heal. The Motto of the MacIver Clan shield is " I Will Never Forget". This is so true for the family of Donald MacIver. Our families will never forget him.